A couple of days ago, Apple introduced its very own battery case for the iPhone 6 and iPhone 6s – the Smart Battery Case. The new accessory drew negative comments and snarky jabs for two reasons. First, many find its design to be surprisingly unappealing, with a tortoise shell-like hump on the case's back instead of just having a more streamlined shape throughout. Second, many poked fun at the fact that Apple itself was putting out a battery case. Thus, the company was “admitting” that its flagship smartphone has worse battery life when compared to competitors' high-ends. Apple CEO Tim Cook was recently attending an Hour of Code event at an Apple store in New York City and was open to answer a couple of questions about the new Smart Battery Case. His explanation about the unsightly “hump” (he did mention he doesn't like calling it that, of course) was that the design team wanted to create a battery case that is easy to put on or take off. Having the Smart Battery Case be made by a single piece of soft fluoroelastomer (the same material Apple Watch Sport bands are made of) and moving the battery towards the center allows the user to freely bend it around its edges, making it easier to slip the phone in or out. Given our experience with the battery cases that we've gotten to fiddle with over the years, we'd say we have to agree that it is sometimes quite a difficult task to cram a smartphone in them, and often even harder to remove it. The issue comes from the fact that a conventional battery case will usually consist of a single hard plastic piece that fits very snug around the device, and a “cap” piece that snaps on top to keep the phone protected from all sides. All of this usually takes some force, patience, and solid nerves to put together or take apart. Second, Mr. Cook talked about the jabs at the iPhone 6s' battery life. He argued that users who charge their smartphones on a daily basis will probably not need a battery case. The product is meant for people who happen to travel, hike, or otherwise put themselves in a position where they will be away from a power outlet for a while. That's all good, but we still think that hikers would much rather have a tough-to-put-on third party case when on a trip, instead of a soft case around their expensive iPhone 6 / 6s. And, the $99 price-tag of the Smart Battery Case can actually buy you a pretty rugged 3rd party case, usually with a battery larger than the 1,877 mAh cell found in Apple's accessory. What say you, though? Would you rather go for the full Apple experience and shell out for a Smart Battery Case, accepting the “hump” and all that, or would you prefer a tough, large 3rd party case? My hump! My hump! My lovely lady hump! Here's a novel concept. How about putting a larger battery in the iPhone in the first place instead of always trying to make a thin stupid phone. If you use this $100 case with a small battery, then you have lost the thin part anyway. This is just a way for Apple to take in more money. LOL, stop trying to make sense, this was done perfectly by Apple to milk the flock as much as possible. The Apple fandom is pretty stupid most of the time and this is one of those times. First they praised the size and how easy it was to hold. Then they literally praised the thinness and "good" design. Finally, they all bowed down in awe of the battery life. Then they put an ugly case on it with an added batter that made the smaller phone larger and fatter than most phablets (for $100 more). Rinse (milk?) and repeat every single year. Or rather cook will be singing "my money making hump." With a $600+ tag price, iphones should have a big, efficient battery from the very start. how does he think a 100 dollar back up battery when juice pak will do it better for less. Tim Cook is the Ballmer of Apple! Steve Jobs must be spinning of rage in his grave... So freaking pathetic !!! And then if you do the same for the home button........ Genius! What do you say, wanna start a company with with me?! This is the ugliest battery case I ever seen. this is the ugliest thing I have seen. The next thing you know,we will have an iphone battery case that is as thick as a CRT tv. Samsung doesn't do ugly anymore. Their Vr design is simply the most attractive. Their current flagships are easily the most compact and beautiful and I'm an iPhone user. Why are you so obsessed with Samsung? And as far as I know, Samsung offer one of the best looking official accessories around. They collaborate with the best fashion designers and artists out there when designing their accessories. Apple is trying to follow samsung by releasing this monstrosity. All east the Samsung battery case looks ten times better than that crap timcock release. What the heck does Samsung make, that's ugly? We are the very same people who patronize and praise these phones (iPhone to be specific) for their thinness. 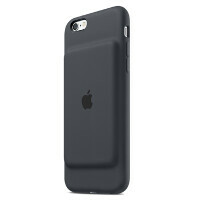 Now see , they have have designed an ugly battery case which will thicken our iPhone . Yet still , fools like myself will buy it. I now admit majority of humans are fools, else iPhone wouldn't sell that much considering their tiny battery life , low specs , inferior camera and over price tag . I won't be a slave to iPhone . I have totally advised myself . I will use an iPhone below 3000mah. ..
Just get a Lumia 950 or 950 XL, they have better hardware and they both have a battery over 3000 mAH. iPhone users will put on an ugly case anyway, may as well be useful. I'm pretty surprised, and disappointed at Apple design lately. First it was the iPhone antenna lines, then it was the way you charge the Apple Pencil and Magic Mouse 2, and finally it was the design for their battery case. Hopefully things will turn around and they'll really impress with the iPhone 7 design. Just look at the Apple Watch. If that's the best fashion product they can do with their resources, they don't have it. Yes the iPhone 5 was nice and maybe the iPhone 4 if you don't mind stumpy looking short phones but that's about it.